In places the lower limestones are rich in fossils, showing that the shallow seas were inhabited by an abundance and diversity of shellfish similar in kind to those found in the Carboniferous limestones of Europe, but belonging to different genera and species. Corals, calcareous algae, moss-animals (bryozoans) and sealilies (crinoids) grew attached to the seafloor and helped baffle the currents, providing shelter and less mobile surface sediments, making them more suitable for settlement and habitation by brachiopods, bivalves, snails, trilobites, ostracods and fish. Occasional stem fragments of clubmoss are found, showing that land was probably not far away. Tropical storms carried the floating plant fragments out to sea, where they eventually became waterlogged and sank to the seabed. The more varied sediments that were laid down in the second phase of deposition (the Surprise Canyon Formation) contain an even richer and more diverse fossil biota, one of the best found in the Canyon's strata overall. These sediments infill the channels eroded into the underlying Redwall limestones and range from conglomerates through sands and silts to lime muds. Over 60 species of marine shellfish, similar to those of the Redwall Limestone, are known along with some shark teeth. Again, conodonts have been used to pin down the exact biostratigraphy. Besides the remains of sea creatures, the remains of land-derived plants are common in places, with numerous logs of clubmoss and seedfern, and some 12 species have been identified so far. As we have seen, the record of fossil plants can be highly problematic because of their fragmentation before burial. Consequently, attempts to reconstruct what the original forests looked like is fraught with difficulty. Nevertheless, the North American forest gives us some remarkable insights where there is rare preservation of significant numbers of tree stumps and even trunks in situ, in other words 'in place' - where they lived. It is the wonderful rock record of Nova Scotia and New Brunswick that preserves the critical information. The remains of Mississippian (Lower Carboniferous) fossil forests are exceedingly rare, but over 700 fossil trees are known in New Brunswick. Most are clubmosses (lycopsids of the Protostigmaria-Lepidodendron type), which grew in extremely dense stands on delta wetlands. Nevertheless, they were still occasionally swept by forest fires and flooded by seawater. The forest grew in clumps of relatively small trees with trunk diameters of 3-12 cm and heights of up to 12 m. Estimated densities of between 10,000 and 30,000 trees per hectare (1-3 trees per sq m) have been calculated, much higher than most modern forests because their canopies minimised light competition. Being Lower Carboniferous in age these were the precursors to the main Upper Carboniferous (Pennsylvanian) Coal Measure forests and are therefore of great importance in helping our understanding of how such forests developed. 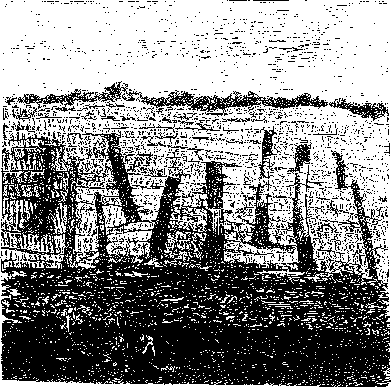 Adolphe Brongniart's illustration of the headwall of a French opencast coalmine at Treuil, St Etienne, showing sediment filled casts of large tree trunks still in their original life position, growing out of a coal seam into the sandstone strata above. The Coal Measure forests of Nova Scotia have been world famous since the middle decades of the nineteenth century, when they were visited by Charles Lyell and William Dawson. In Pennsylvanian times vast tracts of these peat-forming tropical rainforests stretched from Kentucky to the Urals in an almost continuous belt. The overall biomass of these coal measure forests was considerably greater than the earlier Mississippian-age ones. In Nova Scotia, shoreline exposures of the strata preserve sediment-filled casts of tree trunks of Lepidodendron and Sigillaria several metres high, although originally they stood up to 30 m high. In places there are hollow tree stumps burned out by wildfire. Lyell and Dawson found the first skeletal remains of land-living primitive reptile relatives, such as Hylonomus, within the stumps. When Walcott came to try to correlate these Canyon strata with those elsewhere in the continent and abroad, he and his fellow American geologists of the 1890s were confronted with an extensive and confusing proliferation of stratigraphic names. Different successions of strata were being recognised across the vast length and breadth of the continent. Questions frequently arose concerning how local and regional units might be correlated with those described by geologists elsewhere, especially with those of Europe where so much of Earth Time was first carved up into systems and periods. To try to reduce the confusion, the United States Geological Survey published a whole series of Correlation Papers in which these matters were discussed at length. When it came to the Carboniferous, Henry Shaler Williams proposed the name Mississippian for a series of strata that correlated with the lower Carboniferous (Mountain Limestone) of Europe. He described the American strata as predominantly composed of limestones lying above Devonian strata and below the coal measures. He chose an exposure of strata in the upper Mississippi River Valley as being typical of the series. Furthermore, he chose some Pennsylvanian coal-bearing strata as typical of his upper series and called it Pennsylvanian, making the two series subdivisions of the Carboniferous System, as recognised elsewhere. Henry Shaler Williams, 1847-1918, Yale-trained palaeontologist, first worked in his family business (1872-9) then returned to palaeontology at Cornell (from 1879-92), then Yale, where he was Dana's successor (1892-1904) before finally returning to Cornell (1904-12). He proposed the names Mississippian and Pennsylvanian respectively for the lower and upper part of the Carboniferous System in America. A decade later, T. C. Chamberlin and R. D. Salisbury raised the two series to system level in their popular and influential Textbook of Geology. They claimed that there was an unconformity separating the two series and sufficient difference in the kinds of strata found to warrant this higher-level distinction. A whole new generation of American geology students were weaned on this text and many of them joined the expanding body of professional geologists staffing the various state surveys and other geological organisations and commercial companies. The scheme had the added benefit of giving an American dimension to the stratigraphie subdivision of Earth Time, which was otherwise dominated by all these systems derived from European strata. By the 1930s most of the state surveys had adopted the scheme, but not until May 14th, 1953 did the national organisation, the United States Geological Survey, adopt the terms officially. The rest of the world still uses Conybeare and Phillips's 1822 modification as Carboniferous of D'Omalius d'Halloy's 1808 name Terrain Bituminifere. Thomas Chrowder Chamberlin, 1843-1928, classically educated at Beloit College, Wisconsin where he became professor of geology (1873-82), Wisconsin state geologist and chief of the glacial division (1876-1904), first professor of geology in Chicago (1892-1919) and co-author (with R. D. Salisbury) of the influential Textbook of Geology. President of the Geological Society of America (1894) and founded the Journal of Geology (1893). He supported the idea of multiple glaciations and a planetismal origin for the Earth. Mississippian boundary does not exactly coincide with the boundary between the Mountain Limestones (Lower Carboniferous or Dinantian as it is also known) and Coal Measures (Upper Carboniferous or Silesian as it is also known) of Europe, but occurs within the lower part of the Silesian. The small print of the agreement has yet to be worked out. A series of brilliant red and red-brown cliffs and steps rise for the best part of 1000 feet (330 m) above the Redwall Limestone. Altogether a variety of sandstones, limestones, muds, pebble beds and evaporites are known by geologists as the Supai Group and contain five separate recognisable formations. The formation is one of the basic units of geological mapping and the distinction of successive strata. It consists of a sequence of strata that have enough features in common to allow them to be mapped as a unit distinct from those above and below. The varying hardness of the separate rock types results in differential weathering to produce alternating cliffs of relatively hard sediment, such as sandstone and limestone, and steps of softer, more easily weathered rocks such as mudstone and evaporites. Their strong red colouration has provided the insoluble iron-based pigments that have so spectacularly stained the underlying Redwall Limestone. We now know that there is yet another unconformity of some 15-20 million years duration separating the Supai strata from the Redwall below. Furthermore, the Supai's 50-million-year timespan from around 320-270 million years ago takes us from the uppermost part of Mississippian Earth Time up through the Pennsylvanian and across the border into Permian Earth Time. It is a chronological journey that also turns out to be full of holes - more gaps in the stratigraphic record. These reflect an increasingly unstable geological environment with fluctuating sea levels and constantly migrating coastlines, producing alternations of marine-intermediate-terrestrial environments of deposition. But there are no signs of the coal deposits that typify Henry Shaler Williams's type Pennsylvanian and the upper Carboniferous of Europe. Nor is there a clear boundary with Murchison's Permian. If Earth Time had been carved up here, the major systems and periods would have been very different. The overall regional depositional slope seems to have been down from land in the east to a seaway in the west, with marine transgressions proceeding from west to east and the reverse for regressions. The increasing abundance of sandstones and decrease in limestones reflect the changing environments of deposition. It can be very difficult to determine exactly how some sandstones were originally laid down. The problem is that deposition on broad coastal sandflats can produce very similar structures as deposition in some desert situations. The general accepted interpretation is that many of the sands were laid down on a broad coastal plain with a hinterland to the east of arid and semi-arid landscapes. But recently some of the sandstones have been reinterpreted as true eolian sands laid down in desert conditions. As we shall see, there are younger strata a little higher in the Canyon that preserve a much more spectacular record of desert sands. Although there are fossils in the Supai strata, especially in the seabed deposits, few of them are useful for accurate correlation and relative dating. The most common remains are trace fossils - marks left by any kind of past 'activity' by plant or animal, so they range from feeding marks to trackways and burrows. Fine-grained sandstones and mudstones can be particularly good substrates for preserving trace fossils. Indeed, much of the evidence for the kinds of animals that lived on land during Permian Earth Time comes from trace fossils preserved in desert dune sandstones, animals such as scorpions and millipedes. However, the best evidence is found in the higher and younger Coconino Sandstone. It is surprising how much information about the extinct life of the past can be recovered from trace fossils - once you know how to read the signs. The problem is that rarely are there associated fossil remains that identify the organism that made the trace. The fossils that provided the first clues to the relative age of the strata were marine lampshells (brachiopods) and unicelled fusilinids. Correlation with similar strata beyond the Canyon that contain typical Permian-age plants and conodonts seems to confirm the overall age diagnosis. The sandstones of the Coconino Formation form one of the most conspicuous rock outcrops in the Canyon. In the central part of the Canyon the sandstones are up to 183 m (600 ft) thick and reach as much as 30$ m (1000 ft) along the Mogollon Rim near Pine in Arizona, but they also thin down to less than 20 m (6$ ft) in other parts of the Canyon. The difference is probably due to differential rates of subsidence of the basin of deposition. The sandstones' most spectacular feature is the dune cross-bedding, which is clearly visible from a considerable distance. Great downward-curving concave sets of lines traverse the sandstones with slopes of up 30 degrees over vertical thicknesses of up to 20 m (66 ft). They are readily explicable as the forward-facing (downwind) slopes (the so-called foresets) of large-scale desert dunes. Many other types of sedimentary structures associated with desert conditions can be observed, ranging from small-scale ripple marks that covered the surface of the larger dunes right down to rainprints that record the occasional rainstorm. The orientation of many of these structures reflects the prevailing winds of the time. Modern studies of the dynamics of sand movement and deposition in hot deserts has verified that there was a Sahara-like dune field extending across this region and as far north as Montana in early Permian times. The whole formation records the advance and passage of a major sand sea across the region, with prevailing winds from the north and a migration southwards. Its existence at this time verifies the palaeomagnetic evidence that places Laurentia on the equator at this time. And the fossil record of tracks and trails preserved in the sands provide evidence that it was, as expected for such a geographical position, a hot, dry desert. reflects the difficulty of preserving their remains in such environments. Even if occasional body parts or bones are dessicated and buried, the porosity of the sands means that even after burial, percolating groundwater will destroy the remains, either making them unrecognisable or removing them altogether. As we know from studies of modern deserts, it is surprising just how much life can survive in such extreme environments. Anywhere that water collects, however briefly, whether it is from dew or occasional storms, attracts and promotes life. Cooler night-time temperatures encourage nocturnal animals and cooler subsurface temperatures encourage animals that can burrow in the loose sand. What the Coconino Sandstone does preserve remarkably well are the traces of that desert life; the only problem is how to identify what organisms made them. Modern experimental work has helped enormously with the interpretation of fossil traces. A range of actively mobile living animals, which provide appropriate analogues for the fossil ones, have been observed moving over different sediment substrates under varying conditions of temperature, humidity and slope. Even scorpions are affected by the surface temperature of the sand and modify the way they walk over the sand accordingly. One Coconino scorpion trace that preserves marks made by the tail is very similar in form to that made by a modern scorpion (Centruroides) when the temperature is around 15 degrees Celsius (60 degrees Fahrenheit). At higher temperatures, the tail is lifted clear of the hot sand and does not leave a trace. The form of the trace is also greatly affected by the cohesiveness of the sediment, which in turn is controlled partly by composition but also by the presence of moisture. Clean, clear-cut prints are left by animals crossing damp sand. The sand does not have to be under water, but can have its surface moistened by dew, and even the delicate footprints of millipedes, isopods, spiders and scorpions can be preserved. The remarkable eight-'footed' spider prints are similar to those made by living desert-dwelling spiders such as tarantulas, wolf spiders or trapdoor spiders. In addition, the prints of small primitive reptiles have also been found. The form and preservation of some of the latter indicate that they were climbing dune slopes made of loose sand. Experiments show that the slopes have to have angles less than 27 degrees to preserve the prints, otherwise avalanching by the loose sand completely destroys them. Some 10 different 'ichnogenera' have been described, with even more 'ichnospecies'. Because there are no skeletal remains associated with the tracks, they cannot be directly linked to known species based on skeletal remains, but nevertheless it is useful to try to distinguish between different kinds of traces, hence the use of ichno - meaning trace - genera and species. Some of the footprints clearly show signs of five toes on the hindlimbs and four on the forelimbs, indicating that the fifth is reduced in size or specialised in some way and held above the substrate. One of the major problems of the Coconino is that of placing it in time. With no biostratigraphically useful fossils and no rocks that can be radiometrically dated, the detailed age is problematic, but it is bounded by known early-Permian-age strata. As we shall see, the overlying Toroweap strata have been assigned to the late Artinskian stage, around 278 million years old. Changing environmental conditions mark the top of the Coconino and beginning of the deposits of the Toroweap Formation. Once again, the seas reinvaded the region from the west. For the visitor to the Canyon looking out and down from the viewpoints, the top of the Canyon's layered pile of strata is marked by the 90-120 m (300-400 ft) high grey-stepped cliff of the Kaibab Formation limestones. Different sedimentary rocks with varying resistance to weathering and erosion produce the stepped profile. The cliff rises above a scrubby vegetated slope developed in the underlying Toroweap Formation. The uppermost Kaibab strata form the bedrock for much of the surrounding Kaibab and Coconino plateaux and are among the most accessible of the Canyon rocks from numerous trailheads. Since Jules Marcou first recorded their presence in 1856, geologists have studied the limestones and shales that make up the Toroweap and Kaibab strata in great detail. 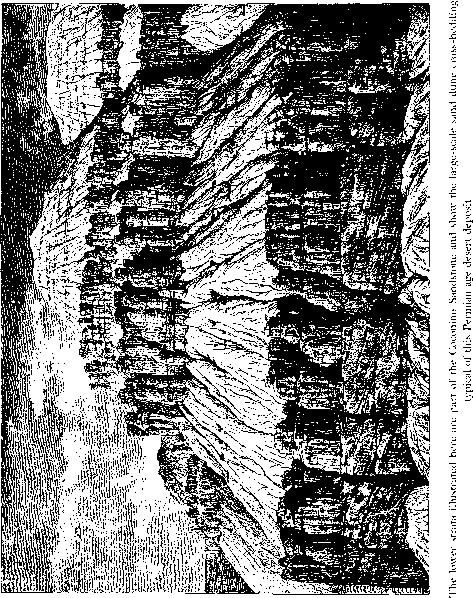 Late nineteenth-century geologists such as G. K. Gilbert and Walcott saw the Kaibab and Toroweap strata as forming a single unit called the Aubrey Limestone. A great deal is now known about the original deposits and the environments in which they were laid down. Although not striking or outstanding in its outcrop, the Toroweap Formation strata show the largest geological diversity of any of the Canyon's recognisable rock units. The rocks cover some 65,000 sq km (25,000 sq miles) of Arizona and their deposition marks the beginning of a marine incursion. The result is a complex succession of up to 150 m of strata formed from sands, lime-muds, evaporites (gypsum and dolomite) and red beds, which reflect shallow marine, tidal flat, sabkha and eolian sand-dune environments of deposition. The shoreline moved back and forth across the region, which is why the deposits now seen in the Canyon vary so much. 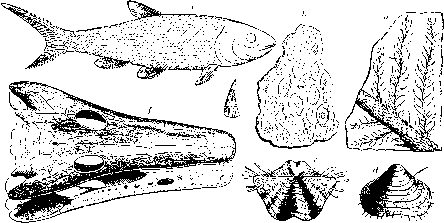 animals (bryozoans), sealilies (crinoids) and occasional horn corals. Some trace fossils such as borings and burrows indicate that they were also of course many soft-bodied animals around that are otherwise not preserved. The shallower-water, near-shore carbonates and evaporites were deposited in much more biologically stressful environments. Marked changes in temperature, salinity and oxygen content of the seawater can only be tolerated by really tough animals that are specially adapted to life in such conditions. There are not many of them, but there are a few snails and clams that can cope. They tend to be opportunistic species that can produce very high numbers of offspring. With a lack of competition from other organisms, they can flourish but are susceptible to mass kills when conditions suddenly deteriorate. Such local extinction events leave abundant shells in the sediment and these have a high fossilisation potential. The Kaibab Formation forms a caprock up to 150 m (500 ft) thick to the Grand Canyon and, whether they realise it or not, it is the rock outcrop that most visitors first see. The Kaibab outcrop forms the surface of the Kaibab and Coconino plateaux into which the deepest parts of the Canyon are carved. This is also where most of the scenic viewpoints and trailheads are situated, so it is also where most visitors go. To the uninitiated it might seem surprising that the youngest rock strata of the Canyon are still predominantly seabed sediments over 26$ million years old and belong to the Permian System of Palaeozoic Earth Time. We will return to the question of why are there no younger strata preserved here. Outcrops of Kaibab strata have been found over a region stretching eastwards from Las Vegas in Nevada and southwards from the Deep Creek Mountains in Utah, with some subsurface outcrops proven by drill holes in southern Utah where they contain oil. were being laid down in different parts of the region. The problem for geologists is how to work out what deposits are of similar age, or how to draw timelines through the piles of sedimentary strata. 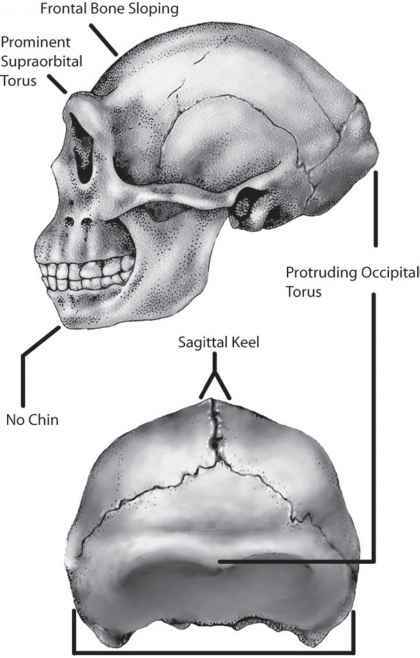 It can be very difficult, depending on how fossiliferous the strata are and whether the fossils from one facies can be matched with those of another contemporary facies. Life in these mid-Permian-age seas was remarkably varied and abundant, as can be seen from some highly fossiliferous strata within the Kaibab Formation. Again, a non-expert examining fossils in the rocks or beachcombing for shells here 265 million years ago would have had difficulty identifying the exact animal group to which many of the fossils belong. Indeed, some of them, such as the seamosses (bryozoans) and sealilies (crinoids) look a bit more like some curious kind of plant than animal. Since the 1930s, specialist palaeontologists have collected and described large numbers of fossils belonging to their own particular interests from these strata. We know that the seabed was populated by 'meadows' of sponges, fan-shaped seamosses, corals and sealilies, which grew rooted in the sediment and attached to bits of shells. They helped secure the loose seabed sediment and baffled the water currents, providing shelter for a host of other animals. Tiny shelled unicells called forams and small shelled, shrimp-like ostracods occupied the top layer of the sediment, while various worms burrowed into it. Lying on the seabed were different kinds of shelled organisms, some of which look a bit like clams but are actually a different kind of animal called a lamp-shell (brachiopod), which still survives today but with nothing like its Permian numbers and diversity. Like clams, it made its living by sitting around filtering tiny bits of organic matter from the seawater. A similar mode of existence was employed by other seabed life such as the more familiar-looking clams, snails and tusk shells (scaphopods). But then scurrying around among the more sedentary life were strange, king-crab-like creatures called trilobites, which are familiar to all fossil collectors but otherwise unknown even to many biologists. With their jointed limbs and hard exoskeletons, the trilobites were a group of marine arthropods not far from extinction. Other active and mobile creatures included the squid-like nautiloid cephalopods, which carried a long, cone-shaped shell that aided swimming by providing buoyancy and streamlining. Locally they were abundant, swimming in fast-moving shoals for protection. The top predators were fish, which ranged from a variety of sharks to primitive bony fish whose teeth and scales accumulated in the sediment when they died. Strangest of all the swimming creatures were the tiny eel-shaped conodonts, which were very abundant and provided food for many of the smaller fish. But the conodonts were themselves carnivores and armed with a mouthful of spiky tooth-structures. They had no jaws and the whole tooth apparatus was extended to grasp the prey; as it was retracted the teeth closed and chopped the prey into pieces and delivered the bits into the gut. The conodonts are another extinct group and generally all we find of them is their tiny teeth (about i mm long). Because conodonts were so abundant and their teeth are often well preserved and show lots of specific variation, their fossils are very useful in helping match contemporary strata regionally and even across oceans. Indeed, conodonts have been used to constrain the time range (estimated to be between 270.6 ±0.7 and 268.0 ±0.7 million years ago) of the Kaibab strata with recognition of Roadian-stage species. All these Kaibab fossils are just the remains of organisms that can be preserved in sedimentary rocks. There were of course many other, entirely soft-bodied creatures that would have been present, ranging from jellyfish to worms and so on. The presence of numerous sponges and corals and the general abundance and variety of life suggest that these deposits were laid down in warm tropical waters. And many characteristics of the sediments support such an interpretation. There are evaporite minerals such as gypsum that only form where there are the high water temperatures and evaporation typical of the tropics. This interpretation is verified by independent geophysical evidence showing that during mid to late Permian times the American part of North America lay between the equator and 30 degrees North, some 10 degrees south of its present position.